What a month! This month the challenge was truly challenging. The fabulous component is a clasp, a coin clasp made by Niky Sayers. And its an Irish hare coin. Now I love this as the hare is “my” animal. And I am of Celtic/Irish descent. And it looks like a full moon, and brings to mind the lunar hare that is my icon, and new logo. SO clearly this is destined for me to keep! A few of my favorite things, including related pieces by Niky in my stash! Or do I want to go chunky? I debated so much… my favorite stones? chunky statement stones? symbolic stones chosen for their attributes to make it more of a talisman? And my favorite stones won! I know that this is an exceptionally simple, dare I say boring design. But I it means a lot to me and I will wear it all the time! Garnet: unyielding strength, increasing willpower, vitality. Labradorite: For self-discovery, it is excellent for awakening one’s own awareness of inner spirit, intuition and psychic abilities. Please visit my team mates and our guests! Enjoy! The start of it all this month! Lampwork bee beads by Laney! I knew right away that I wanted to wet felt a flower, maybe a brooch. I mean The season is changing – won’t is feel like Fall soon? When I got home I realized – like the lightbulb over one’s head – that my COM was in my hands. I love the colors together! I work hardened a copper wire to form a spike. I coiled a little “sproing” for my bee. With a wire tongue of sorts and a little bending – he was in place! I love the aqua set off amongst the complementary curly locks. I knew from the first it would be a bracelet. Bead/cap by Marsha Neal Studio. Scarab bead by Sue. Do I dare? Do I dare tackle my first ever freeform peyote stitch project? I am a Virgo to the fullest, a lover of order… I do well with freeform bead embroidery – but that is a structured stitching – so I can go wild with bead shapes and colors and textures and patterns. Freeform peyote is all that freedom AND learning the structure. Adapting, working in a sculptural way. There was a lot of tangling. Some cursing…. I decided to use 4 lb Fireline. Thin enough for multiple passes through beads, but strong and forgiving. ( I really don’t like Nymo) There are mistakes, there are sections that “ruffled” up but in general… IT WORKED! Here are the shots of the completed bracelet. It fits (me) perfectly! I will definitely take this further and experiment more with freeform peyote! (I apologize if the links are dead. I’ll fix ASAP. Waylaid by a stomach flu on vacation…. for now see all the links at Art Elements. So you can see the plan for the overall composition here. Its going to be a large piece, wearable for special occasions? Or cosplay… Since I was fixated on this composition – Caroline’s luster cab was the best choice – both for scale and color. This wasn’t the color palette I would have ever predicted – but I love the two ceramic pieces together! Beaded, and dangles selected: crystal points and mismatched headpins by Nikki Thornburg. The beaded cab/bezel is sewn to the wire framework with 24 gauge wire running side to side. The supplemental wire ( visible on the bottom section) is to prevent the beaded cab from spinning in the wire frame. Sketch for the necklace portion with possible gems. Trying out gem combinations – what do YOU think? I am leaning towards the oval aquamarines. While they are smaller in scale – the colors accentuate and visually link the necklace to the shell. Those huge citrine nuggets are pretty yummy, though… I plan to stare at it for a few days – then finish it off with silk! Until then – please take a look at the friends and colleagues participating this month! And thanks Lesley for such a beauty! April Component of the Month Reveal! The first would be a stoneware/ceramic sculpture – sized so that the bead is a planet held in her upraised hands. ( It WAS just Earth Day.) Maybe 8″? But tapered to a point like the Cycladic figures I adore – and standing in a wrought iron stand. My second idea – small polymer mermaid on driftwood. I am thinking this would be a wall hanging… it is rather long. But it was such a visual treat to pull gems to go with this glass! Simply gorgeous. And yes – its a moon hare motif that is so very “me”. I love this bead – and the longer I look at it the more ideas I have – who knows? I may still start that stoneware goddess figure. For now – take a look at my AE team mates and out guests this month! Amulet bags: the March Art Elements reveal! Sakura inspired amulet bag with bronze clay floral by Lesley. Turquoise eye amulet bag features a milagro. Now – I have a plentiful stash of leather scraps. From Lindsay, from friends who are leather workers at Rennaissance fairs… This stamped leather was from Lindsay – and the natural edge is a thing of beauty. All I did was fold it up, trim the inside edge, and stitch the sides! The hole in the flap was there – so I made a loop and bar closure. OK – now I am on a roll – my tasted do seem to really like leather for this challenge. Two more – simple envelope shapes… One has silks stitched in; the other – can you see the wee grommets in the right hand pix? I wanted these to be wearable, and not to worry that the soft leather would stretch or tear. Brass stamping of moon and star. Ceramic bead by White Clover Kiln. Perfect size for a gemstone worry stone. 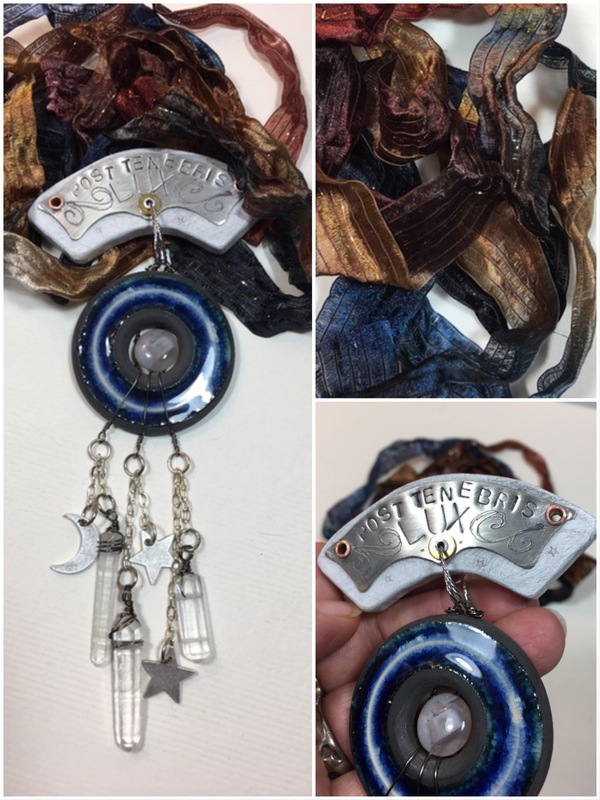 Last one – This scrap is thanks to Elisabeth – from my recent Girls Bead retreat! I let the scrap shapes decide on the amulets. And then charms and more charms! I am sorry that I don’t have any of these completely finished with straps etc. I do plan to… perhaps in time for my first Faerie Festival of the year? Simple on the surface – and then charmed! I can’t believe we have turned the calendar page to December… Before we deck the halls, and fatten the goose – lets take a minute or two for the November COM over at Art Elements! This month we had a guest artist! 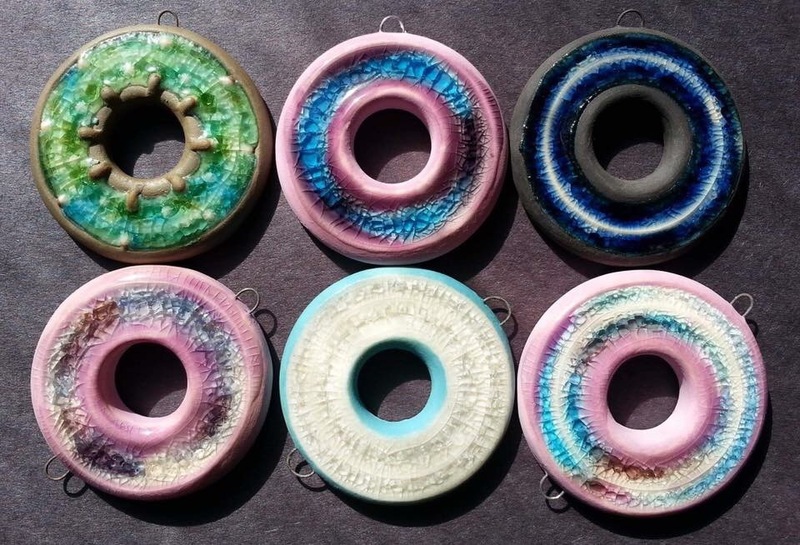 Kristie Roeder of Artisan Clay donated a few of her signature glass/glaze circular pendants. They are rich in color – pools you can dive in to! As you would expect – I forgot to take a picture of mine when I received it… I got the one pictured here on the top right! The colors were evocative of the night sky to me – and we had a Super Moon on November 14th. Wheels are turning… the Muse taps me on the shoulder. 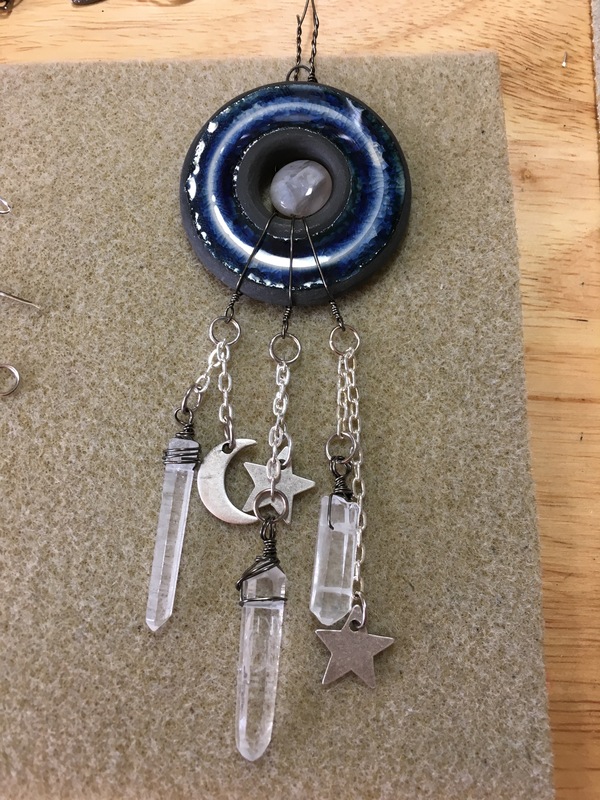 And I knew I would wire the “moon” into the center of the piece. Then stars, then crystals… and it all came together quickly. Umm – love it all and its too big for me to wear – even better! I’ll hang it in my studio! Thanks for stopping in and please don’t miss the other designs this month from guests and team mates alike. Time flies so fast in the Fall. Shows, nice crisp weather, classes to teach… and Halloween. This month at Art Elements blog (formerly Art Jewelry Elements) We have a super cool lamp work glass skull! These are the creations from Jen Cameron/Glass Addictions. And they are wicked cool. I knew I wanted a necklace, something colorful and festive. I was actually trying NOT to do too many flowers – like a self imposed regulation to make it harder? Who knows. I have been beading skulls and flowers a lot of late and was trying to do something different. Creating the wire wrapped bail gave me more color – and a hanging mechanism that created a strong statement to set the skull off. I used recycled glass/bottle beads, carnelian, Czech glass: anything and everything in my primary color palette. The back section is three strands: cobalt glass, seed beads and braided sari silk handspun yarn! I know – there IS a lot going on, but the colors played well and it created a volume that balanced the focal. I DO have a second skull, staring up at me from the work table. The primary colors are so out of my usually palette – but I think these links will be in there somehow… The hoplite was a maybe, but the scale was wrong. We shall see! My Dia de los Muertos mantle. Here be headpins ! The AJE Component of the Month reveal. Welcome to the reveal of the AJE headpin challenge! I decided to try something I had never heard nor seen done. I wanted to bead embroider the head pins. WITH the wires intact. Could it be done? Hmm. Lets try. First shapes looked too much like outline of USA, second version works! So the short answer? IT WORKS! I stitched the wires down to hold them in place and secure them. the back is a mess, but Ill show you anyway… This isnt for the faint of heart. Nearly every third stitch got looped on a wire and snagged. See the far left int he bottom picture? Many stitched snagged. I didnt even know when that happened to pick them out. So I added a bit of glue there. Gee, guess I will have to keep this one since it has issues. Beading around the wires proved problematic. details of Jennifer’s headpins in the piece, and a SueBeads dangle! Pearls! Pinch beads! Fire polish! Abalone! No rules seed beading ! And I had SO MUCH FUN. Not sure what to do now? Silk? wire wrap gems? What do you think? 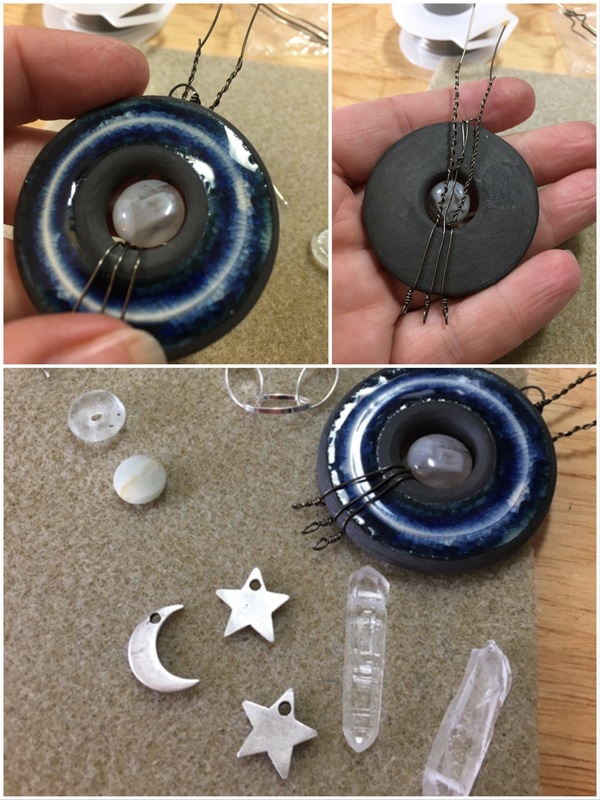 Until next time – Ill be off creating with my new headpins created by Thornburg Studios and Bead Fairy! Please join the AJE team and our guests on this blog hop! I am sure I speak for the whole team that we have so many guests this month. Enjoy!